Who can resist her cuteness? She is a pop icon with fan ranging from 4 and forever. Worldwide most popular cartoon character, Hello Kitty! She is now OPI’s newest muse. 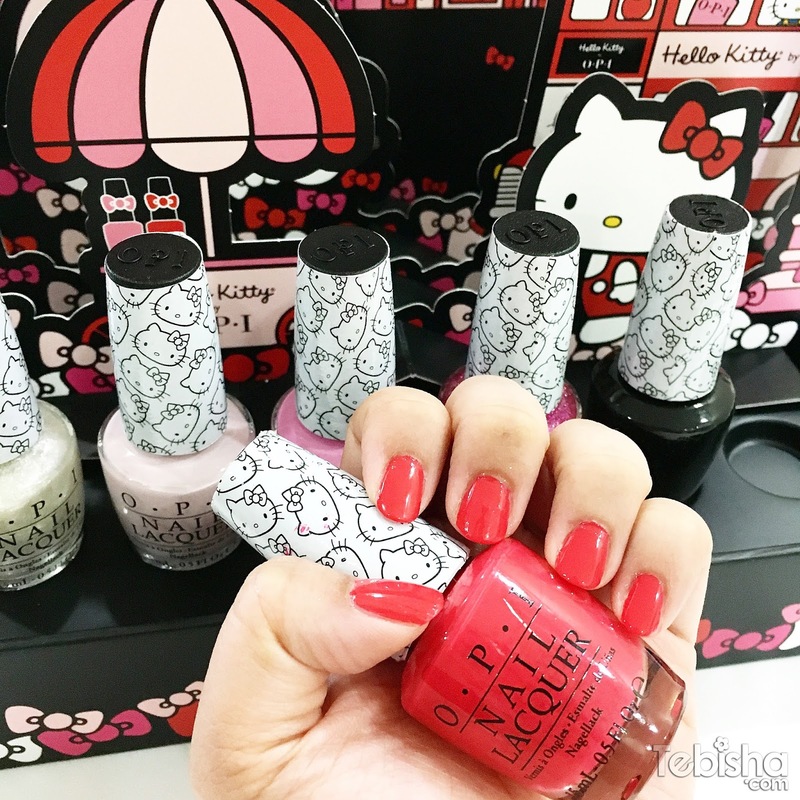 OPI has released their latest and most adorable collection Hello Kitty by OPI. Consists of 12 limited-edition nail lacquers and matching GelColor shades. When I received the surprised package from OPI, I was so excited and anticipated to try out the nail lacquers for Christmas and New Year! OPI is the number 1 salon brand worldwide, it has one of the best nail lacquer brush which enable us to paint our nails neatly and beautifully. I used to be a manicure / pedicure fanatic, I will buy lots of nail polishes and paint my own nails weekly. I even went to learn some manicure & pedicure skills and had became a manicurist for a short period of time. These 2 years, I have stopped painting my nails due to my weak & brittled nails. But I couldn’t resist the lovely shades of the Hello Kitty by OPI collection, I have to beautify my nails with these. Started off with these 4 shades for Christmas! Left hand: Starry-eyed for Dear Daniel & Look at my Bow! Right hand: Kitty White & Let’s be Friends! And my 2016 New Year Nails! This shade going to be perfect for Chinese New Year too! Hello Kitty nail lacquer shade each feature OPI’s exclusive ProWide Brush for the ultimate application. OPI brush always never failed to allow us to apply easily and doesn’t cause bumps at all. This cotton-candy pink is my new bestie. This sweet-girl pink sits right at the top. You will just love this fun pink super-glitter. This apple red really measures up. Let’s “ink” a date for our next manicure! Sparkly pink for pretty pets. Do the math… this baby pink is perfect. I have deep feelings for this pretty coral. This sunny yellow is twice as nice. This true blue is always there for you. Hello Ktty by OPI is now available in both nail lacquer and GelColor formulas. Assorted nail lacquers retail at $16 each bottle. In addition, the Hello Kitty by OPI collection also features 2 duo packs retail at $26 each set. 1. Say Hello to Pretty Pedi comes with 2 nail lacquers (Charmmy & Sugar + Let’s Be Friends) as well as a set of Hello Kitty toe separators. 2. The Coin in My Purse duo pack comes with 2 nail lacquers (Look at My Bow! + Starry-eyed for Dear Daniel) as well as a Hello Kitty coin purse. Thank you OPI Singapore & Coty for the love!